WE CREATED RACK ADDICT ATTRACTANTS OVER SEVERAL YEARS OF RESEARCH AND FIELD TESTING BECAUSE WE WERE TRIED OF USING SO MANY PRODUCTS THAT JUST SIMPLY DO NOT. 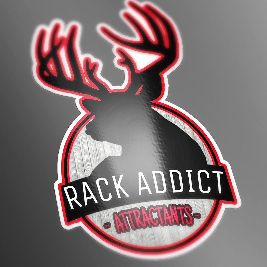 RACK ADDICT ATTRACTANTS IS A OIL BASED PRODUCT MADE FROM NATURAL AND ARTIFICIAL FLAVORINGS. ONE 16OZ BOTTLE TREATS UP TO 700LBS OF FEED. YOU CAN SIMPLY SPRAY IT ON OR MIX IT IN YOUR FEED. WE OFFER 5 FLAVORS ACORN SMASH, PERSIMMON BLAST, PEANUT BUTTER SMASH, CANDY APPLE AND CANDY CORN. RACK ADDICT ATTRACTANTS IS MADE FOR HUNTERS BY HUNTERS. IF YOU WANT TO PULL IN BUCKS FROM THE SURROUNDING PROPERTIES AND HOLD THEM IN YOUR AREA. GIIVE OUR PRODUCT A TRY! RACK ADDICT ATTRACTANTS OFFERS A FULL LINE OF DEER ATTRACTANTS AND MINERALS TO MEET THE NEEDS OF AVID HUNTERS. OUR PRODUCTS CAN BE FED YEAR-ROUND TO MAINTAIN AND, ENCOURAGE ANTLER GROWTH AND ATTRACT DEER. RAA PRODUCTS HAVE A LONG-RANGE ATTRACTANT, LAST FOR WEEKS AND WILL PEAK A WHITETAILS SENSES, RAA IS HABIT FORMING KEEPING THEM COMING BACK FOR MORE! RAA CAN ALSO BE USED IN FEEDERS. ESTABLISH A DAILY FEED SITE WITH RACK ADDICT ATTRACTANTS AND SPRAY OR POUR 1 TO 2OZ OF RAA PER 50LBS OF FEED.